A cornerstone of journalism has always been reporting what key sources say, put in context and given perspective, alongside reported facts. “Do what you do best, and link to the rest” is Jeff Jarvis’ motto for newsrooms — the imperative is to reorient newsrooms from a resource-rich, monopoly distribution approach to reporting, where a newsroom could reasonably aim to do it all themselves, to a resource-constrained, networked media reality, where newsrooms must focus on original reporting that matters most — SUPPLEMENTED by links to other original reporting done by other newsrooms — and by individuals. The idea is that journalists, editors, and newsrooms need to LEVERAGE the web, leverage the network to help them do more — in so many cases now, with less. Just as the reported quote is an essential element of journalism, on the web the “reported link” must become an essential element of journalism. Ultimately, the addition of useful hyperlinking within an online news story reflects the strong reporting of its author. If a reporter does not know of online pages with extra information relating to the story, he or she cannot link to them. But if you have that information, why not share it with those readers who are eager for it? Again, I would take this a step further — links aren’t just a fundamental element of the reporting. Links can BE the reporting. 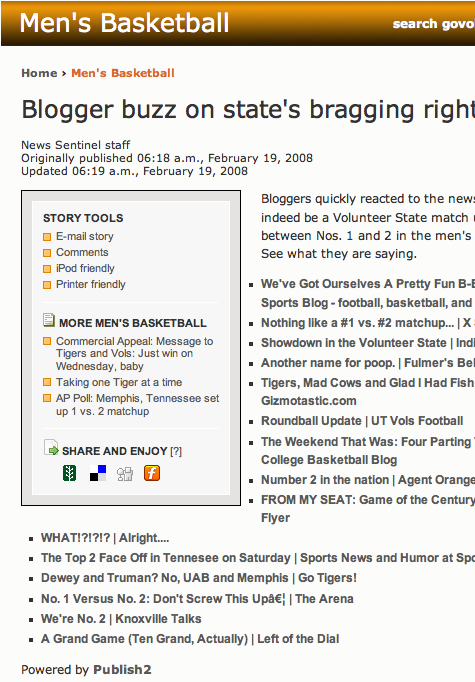 …and used Publish2’s news aggregation platform to transform it into an original piece by REPORTING on what local TN bloggers were saying about the story. But he didn’t pull a bunch of quotes, as he would in a traditional news story — instead, he LINKED to the sources, creating an order of magnitude more value for a news consumer on the web (who, as Robert Niles says, are “eager for it” — just ask Google). This is networked journalism — this is LEVERAGING the network. 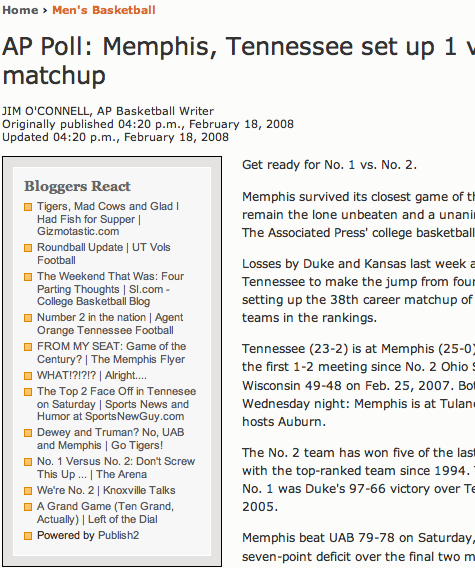 This “article” was in our Top 10 articles on Tuesday for the combined knoxnews/govolsxtra sites. 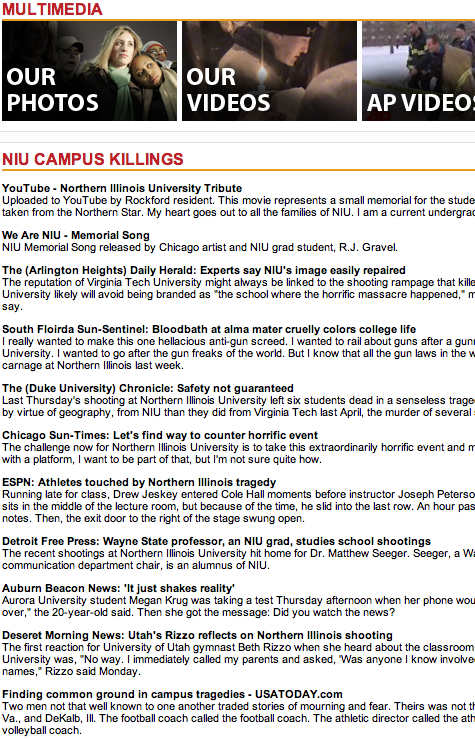 Last week, the Rockford Register Star faced a tragedy in their own backyard with the killings at Northern Illinois University. Rockford did what they do best, reporting literally around the clock to help their shaken community understand what had happened and begin to face the difficult question of why. 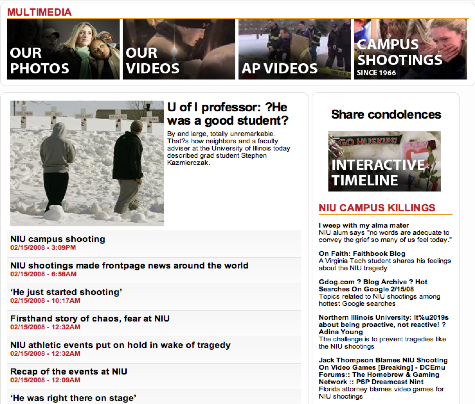 Their coverage goes on for pages, likely one of the most in-depth collections of original reporting on this story. Hat tip also to Rockford Executive Editor Linda Grist Cunningham for providing the kind of “let’s do it” support and encouragement that newsroom innovation requires, and to tireless innovation champion Howard Owens for introducing me to Rockford — I’m looking forward to working with rest of their team. Many news organizations and media companies have been — and some still are — wary of linking to other sites. Why would we send our readers away, the thinking goes, don’t we want them to stay here, on our site? But that’s the funny thing about web — it’s so counterintuitive. 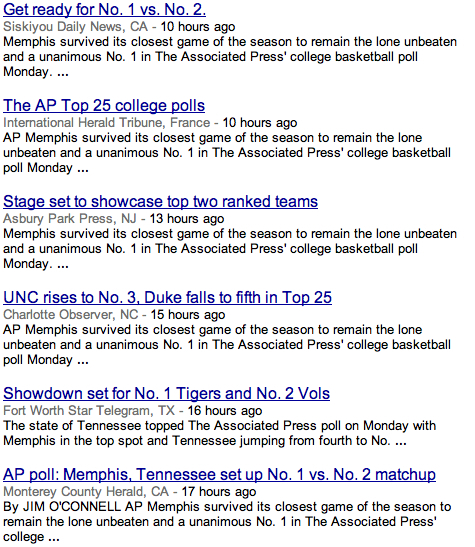 The way it works is almost entirely the opposite of how media used to work. I know of a website that does nothing but send people away — it’s only purposes is to link to other sites. But remarkably, people keep coming back, over and over and over again. Only to be sent away again. In fact, the only reason people keep coming back to this site is because it does such a great job of sending them away. Can you guess which site? Also keep in mind when you think about links as news, links as reporting, and links as editorial product — on the web (thanks in no small part to Google, and its link-based algorithms): Links are influential. Links set the agenda. Links direct public attention. Links connect ideas and people. Everything journalism has always aspired to do.